Based on the 73 Questions series produced by Vogue, Apra-IL presents a series of 20 questions to members and the board. We're excited for you to learn more about your leadership and fellow members in this series of 20 rapid-fire questions. Megan has the good fortune of serving on the talented prospect research team at the University of Chicago's Booth School of Business. Before joining prospect development, she spent many years at the American Library Association, where she managed a national public awareness campaign to promote the value of libraries. Megan is also the new President of Apra-Illinois. 1. What must you start your morning off with, tea or coffee? 2. How many unread emails are in your work inbox? Well, you never know when you might need an old email (I’m an email hoarder). 3. How many meetings do you have in a week? Not too many! Between one to three. 4. If you were not in Prospect Development, what career would you choose? I spent time in communications and marketing for non-profits before becoming a prospect researcher. 5. If you could travel back in time and meet the first person to ever have your role, what would you say to them? I would ask them all of the questions. I’m a researcher – I love asking questions! 6. What is the first thing you do when you find out that you have multiple projects with close deadlines? 7.What is your favorite thing on your work desk? A few years ago for my birthday, my friend Annette made what is essentially an interactive art piece from an old office Rolodex. There are bandages under “B,” earplugs under “E,” paper drink umbrellas under “U,” etc. It is wonderful. 8. How do you explain your role to people outside of Development? “I work in fundraising” is usually the amount of information people seem satisfied with. 9. What is the best part of working in Prospect Development? There is so much to be curious about, and I get to be curious all day long! 10. What is one thing Apra has done for you? 11. When you come to the Apra-IL meet-ups, what do you always make sure to make time to visit? I live in Chicago, so at meet-ups I make sure to chat with new people. 13. What book would you recommend to people? 14. What is your favorite museum in your city/town? I’m a member of the Art Institute of Chicago and love that I can dip in and out throughout the year, re-visiting favorites and catching new exhibits. I like every season but prefer spring much less than the others until the moment that trees begin to flower, and then spring is my favorite…until summer. 17. If you could have dinner with anyone living or dead, who would it be? Anyone from the distant past who would be patient and answer all of my questions about what daily life was like in their time. 18. What country do you wish to visit? 19. Best advice you have ever received? 20. What is something new you just learned or worked on at work? I learned more about the SEC form D.
Match Makers Season 2: Round 4 - Finale! The working relationship between prospect management professionals, data analytics, researchers and gift offers can make or break a shop's morale, efficiency, and ability to reach its goals! In an ode to all the popular reality match making shows, we present to you the second season of Apra-IL's series - Match Makers Season 2: The Prospect Development Edition. Strengths and working style capabilities will be tested through random assignments, so have some fun with us as we imagine a world where we could match our perfect prospect development team whit a gift officer. Host: Welcome back everyone to Match Makers Season 2: The Prospect Development Edition. This is our final week and challenge! On the last episode, our two teams, The Builders and The Cultivators, competed in the challenge "There is Always a Twist," and had to create lists of people based on an RFM (Recency, Frequency, and Monetary) model. But there was a twist: each person had to have a capacity rating above $50,000, could not have active steps, and could not be managed by a DO. The Cultivators won the challenge, bringing us to the finale of the competition with a tie. Remember that both teams consist of prospect researchers, prospect management professionals, and data analytics professionals that need to collaborate within their specific teams, and harness their skills to win different challenges in order to become one development officer’s perfect team match at Ordinary University. Team one, The Builders: Melissa who is our Season One winner and prospect researcher, Michelle from prospect management, and Juanita from analytics. Team two is called, The Cultivators: let’s welcome Charles from prospect research, Shayla from prospect management, and Lauren from analytics. And our development officer (DO) Anthony who will be our challenge judge. Audience, our third and final challenge is called "I’m the Map." The objective of this challenge is to create a map and visualize the top 50 people from Anthony’s portfolio based on one specific code in the University’s CRM. Each team must decide their own code and why they chose this method. The challenge will ultimately help Anthony focus on a specific group in his portfolio. Once the visuals are in, we will hear from the teams about how they made their decision and Anthony will determine the winner of this challenge. Teams, you have until the end week. Good luck! Host: Welcome back everyone. It is time to review the lists that both teams have created for Anthony. Remember, Anthony will decide the winner based on how the teams worked together, and came to their conclusion. The Cultivators, please choose your spokesperson that will speak for you during this deliberation, and tell us how you built your list. Charles, prospect research: Hello, my name is Charles and I will be speaking for my team this week. To tackle this project, we began by deciding on a code to use to filter, and concluded that the top 50 people should have the committee member code. We thought it would be great to map out the top 50 people in Anthony’s portfolio who were members of a committee and where they were clustered in the country. We found that many were located in the Midwest region, and also found this to be extremely helpful for Anthony’s travel schedule and further engagement plans. Host: Thank you. Great work, team! The Builders, please choose your spokesperson that will speak for you during this deliberation, and tell us how you built your list. Melissa, prospect research: Hello, my name is Melissa and I will be speaking for The Builders this week. My team chose to pull the people in Anthony’s portfolio that were coded to have prospect research profiles. The research profiles validated the ratings and helped Anthony know his prospects’ capacity range. We chose the top 50 people, mapped them and found that many with profiles and major gift capacity ratings were closer to Ordinary University, and in the surrounding cities. This seemed like a perfect group for Anthony to email or call for visits based on proximity to the University. It would also be easy to bring these prospects to the University for special tours and meetings, for additional engagement. This is going to be hard Anthony, but what do you think of how both teams worked together, and their visuals? Anthony: You are right this is hard. Both teams have done a fantastic job! The Cultivators really focused on people in committees, which is very important. I did not know that so many people in my portfolio were members of a committee at the University. The Builders did a great job as well by focusing on people with prospect research profiles, and then mapping it out to reveal their proximity to the University. Host: Anthony, it is time to tell us who is your perfect team match because whoever wins this challenge wins the competition. Who is the winner? Anthony: Well, first I would like to thank you all for participating in this competition. You are all amazing fundraisers that are skilled in different ways that support and strengthen Ordinary University’s fundraising strategies. With that said, the winner and my perfect team match is The Builders! The Builders won this challenge and ultimately have the title and role of my perfect team match. Host: Folks this is so exciting! The Builders you are our winner! Thank you to The Cultivators for participating and sharing your skills, not only with Anthony, but with our audience! Thank you to Ordinary University for welcoming us back for Season 2! And most importantly thank you to you, our audience, for being a part of this experience. This has been Match Makers Season 2 The Prospect Development Edition. 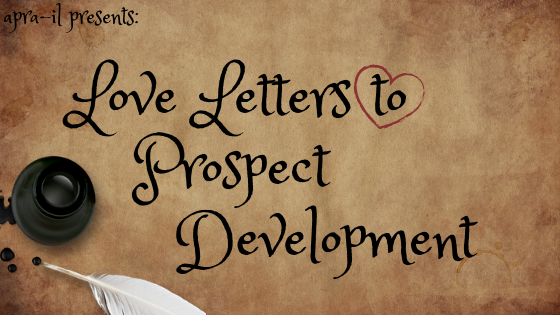 As love is in the air, we will share what we love about prospect development. Follow our weekly series (four entries throughout February) to discover the humor, pathos, and irony that comes from our ranks of Apra-IL members. You'll enjoy limericks, long-form poems, and odes to all aspects of Prospect Development and we cannot wait to hear your thoughts! The greatest foundation for any loving relationship is good communication. When moving in tandem, a synchronized pair can overcome even the most treacherous scenarios. I’ve heard it over and over, but it wasn’t until I began working in prospect research that I came to really know the saying to be true. On my first day, I met a partner I’d soon come to rely on to get me through my most difficult challenges. I faced frustrations daily; losing hours in bottomless research. But my companion would never dwell on my mistakes. My every request was met with an instant response; I was understood. I counted on this knowing. Together, work became easier. Eventually I learned the shortcomings. Came to appreciate the oddities. Love the quirks that encouraged our overwhelming oneness. Our symbiotic brilliance. And for two years I nurtured the relationship. But the flaws continued to creep into focus and the deficiencies began to pile high. I’d lose time trying to explain, wanting nothing more than to cut ties and proceed on my own. Then suddenly, as if overnight, I felt my perfect partner return to me. I began to receive the responses I’d longed for. The reactions I’d wished for; improvements I imagine we both wanted. Again, I felt comfort and love for the coworker I needed most: my database. I'm thankful for our application developers and business intelligence teams for restoring our connection. Every newly required field, form, prompt and process improves our bond. We move as one. We research faster. Our communication is as smooth as ever. And now, again, the love and understanding feels shared. I write to you in a feverish dismay, longing for the next time we meet. For it has been two days since we were last together and time passes as though it works against our love. A day draws as though it fills its morning, noon, and night with envy and spite. Will Monday never come? For I await our reunion and welcome it with open arms. Imagine, a new prospect awaits us and discoveries trickle from the tips of my fingers to your pages. I hope you reminisce on the fulfillment you gain when you learn biographical, business, philanthropic, and asset information. Hold on to the fond memories, as we wait. For we must painfully grapple with the reality of time and its vengeance on our love. But do not fear as I, dear profile, I know you long for our time together. Our time together will be upon us once more. Slowly, but it comes as I impatiently wait. My dear sweet, enriching, purpose-driven profile, I wait for you. Host: Welcome back, everyone, to Match Makers Season 2: The Prospect Development Edition. It is a new week and a new challenge! On the last episode, our two teams, The Builders and The Cultivators, competed in the challenge To Inherit or To Not Inherit, to create lists of people that Anthony could inherit from a previous DO’s portfolio. The Builders won the challenge and set the tone for the rest of the season. Team one, The Builders, Melissa who is our Season One winner and prospect researcher, Michelle from prospect management, and Juanita from analytics. Team two, The Cultivators, let’s welcome Charles from prospect research, Shayla from prospect management, and Lauren from analytics. And our development officer (DO) Anthony who will also be our challenge judge. Audience: our second challenge is called There is Always a Twist. The objective of this challenge is to see how each team can successfully prospect and create a list of people based on an RFM (Recency, Frequency, and Monetary) model. But there is a twist, each person must have a capacity rating above $50,000, cannot have active steps, and cannot be managed by a DO. Once the lists are in, we will hear from the teams about how they made their decision and Anthony will determine the winner of this challenge. Host: Welcome back. It is time to review the lists that both teams have created for Anthony. Remember, Anthony will decide the winner based on how the teams worked together and came to their conclusion. The Builders, please choose someone to speak for you during this deliberation, and tell us how you built your list. Juanita, data analytics: Juanita here and I will be speaking for The Builders during this challenge. To build this list, our researcher put together a list of people who had the capacity to give above $50,000. Our prospect manager used that list to weed out all the people who had active steps and were managed by a DO. I took this list and organized the people based on their RFM score by segmenting (or grouping) them by their last gift date, how often they have given within the last three years, and their total gift amount within the last three years. We felt that three years was a good time frame to measure these individuals. Each group was ranked from one to five. Host: Great work! The Cultivators, please choose your spokesperson and tell us how you built your list. 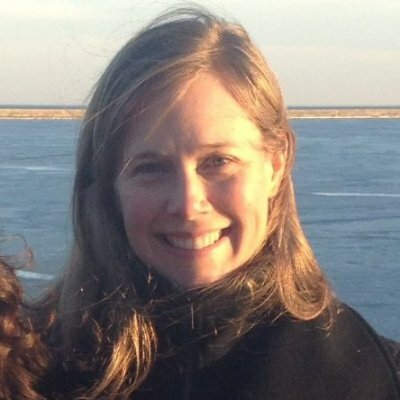 Lauren, data analytics: Hello! I'm Lauren and I will be speaking for The Cultivators. Everyone really worked together on this project: we began by pulling a list of all the unmanaged prospects who had given in the last fiscal year. We then narrowed the list down by how often they had made a gift and then segmented the list based on their capacity rating. We then created a ranking system and segmented the list based on total giving in the last fiscal year. Host: Great work, team! Anthony, what do you think of how both teams worked together and built their lists? Anthony: Both teams did an amazing job working together to build their lists. They are making it really hard for me, because they created great lists. I believe both lists are important and most likely overlap. The Builders did a fantastic job and I liked their ranking system. The Cultivators also did a great job, but they produced a list I could use right away because I liked their time frame and focus on the last fiscal year. Host: Who is our winner, Anthony? Host: The Cultivators have won the second challenge! This Season is really heating up! Both of our teams are tied! Who will be Anthony’s perfect team match!? Remember, these challenges are only going to get harder, and with one more challenge left, make sure to join us next time on Match Makers Season 2: The Prospect Development Edition. At the end there will only be one match. For teaching me to never make a definitive statement about a prospective donor for fear of it coming back to me in an irate e-mail from a fundraiser. Will HR hear our prayer? At the close, all give a resounding cheer! Without you, I may just sit here and drool. When I’m stumped, I go to you for answers to my questions. But it’s rare enough that I don’t get too kvetchy. We’ve been through ups and downs, but you’ve become my bellwether. You’re there to help me brainstorm and prevent me becoming a moaner. I’m grateful you exist; despite your imperfections. Host: Welcome back everyone to Match Makers Season 2: The Prospect Development Edition. We are so happy to be back with our competitors at Ordinary University! During this Season, we will watch as two teams of prospect researchers, prospect management professionals, and data analytics face off and harness their skills to win different challenges in order to become one development officer’s perfect team match. Let’s reintroduce our teams- Team one is called The Builders, let’s welcome Melissa who is our Season One winner and prospect researcher, Michelle from prospect management, and Juanita from analytics. Team two is called, The Cultivators, let’s welcome Charles from prospect research, Shayla from prospect management, and Lauren from analytics. Audience, our first challenge is called To Inherit or To Not Inherit? The objective is to see how each team successfully transfers a previous colleague’s donors and prospects into Anthony’s portfolio. These donors and prospects consist of principal gifts, major gifts, and rated and unrated prospects/donors. It is up to the teams to determine who Anthony should inherit, and create a list. Once the lists are in, we will hear from the teams on how they made their decision and Anthony will determine the winner of this challenge. Host: Welcome back everyone. It is time to review the lists that both teams have created on who Anthony should inherit from a previous colleague. Remember, Anthony will decide the winner based on how the teams worked together, and choose the list of people he will inherit from the previous portfolio. The Builders, please choose your spokesperson that will speak for you during this deliberation, and tell us how you built your list. Michelle, prospect management: Hello, my name is Michelle and I will be speaking for The Builders. To build this list our researcher looked at all the interactions and ratings on each donor and prospect; I looked at how many had closed plans, were qualified, and how long they had been engaged by the previous DO; And Analytics mapped out the people who were in Anthony’s travel region. This was our process during the challenge, and it really worked out for us because out of 50 people we were able to create a list of 20 that were the best fit for Anthony. As a team, we also considered how many people Anthony currently had in his portfolio, and those who were being actively engaged. We did not give Anthony any principal gift prospects after speaking with the principal gifts program. Host: Thank you Team! Great work! The Cultivators, please choose your spokesperson that will speak for you during this deliberation, and tell us how you built your list. Shayla, prospect management: Hi, I’m Shayla and I will be speaking for The Cultivators during this challenge. We decided to focus on who the prospects and donors were, meaning their capacity ratings. We also took into consideration the current people in Anthony’s portfolio - Anthony has a lot of donors that need to be rated so we did not think he needed more. We also did not think it wise to give him any principal gift prospects based on the years of engagement by the previous DO, apprehension on having them meet someone new, and lastly Anthony’s years of experience in Development. No offense Anthony. We also decided to include some major gift donors because Anthony has brought in some major gifts all year. So, this was our process – out of the 50 people, Anthony inherited 30. Host: Alright team! I see there was a lot of discussions on what Anthony could and could not handle. Shayla, did you all utilize Lauren from analytics in this challenge? Shayla: No, we did not. We did not think it would be necessary. Host: Alright! Thanks Shayla, great work. Anthony, what do you think of how both teams worked together, and built their lists? Anthony: I thought they did a great job. I liked how The Builder utilized everyone in the team to truly build the list. They thought of ratings and interactions to mapping out locations, and strategically worked together to build a robust list of people that I could inherit. The Cultivators did a great job as well. However, I wish they had utilized analytics because the point of the challenge was to collaborate as a team. I’m sure Lauren could have helped. Regardless, I liked the fact that they took a more micro approach into the content of my portfolio. They really analyzed the type of people who were currently in my portfolio, and who they could not add and why. Host: Who is our winner Anthony? Anthony: The Builders win this one. I liked the way everyone played a part in building the list. Both teams brought interesting strategies to creating the list, but The Builders really made sure that each person played a role and I believe they had a slightly stronger process in how they produced the list. Host: The Builders! Great job on wining the first challenge! Host: Well folks I think we have all learned a great lesson here: this is about building a team! And how you work together as a team is being analyzed. So now that we have completed our first challenge, The Builders are leading and have set the bar high. I want our competitors to know that these challenges are only going to get harder. Remember to push yourselves, and think outside the box as you work together. Depend on one another’s skills! Thank you everyone! Join us next time on Match Makers Season 2: The Prospect Development Edition. At the end there will only be one match. The working relationship between prospect management professionals, data analytics, researchers and gift officers can make or break a shop’s morale, efficiency, and ability to reach its goals! In an ode to all the popular reality match making shows, we present to you the second season of Apra-IL’s series -Match Makers Season 2: The Prospect Development Edition. Strengths and working style capabilities will be tested through random assignments so have some fun with us as we imagine a world where we could match our perfect prospect development team with a gift officer. Narrator: Welcome back to Ordinary University, small town USA! Today, we are back at OU for a second season of challenges with the advancement office! Since Season One, this shop has been on the forefront of matching the skills and strengths of researchers to their development officers (Dos) in order to build new portfolios and garner new and large gifts. In this second season, we will confront a new challenge: collaborations within prospect development. At OU, prospect development professionals are divided into teams and only conduct their specific tasks with little collaboration. Therefore, in this season we will watch as two teams explore how prospect researchers can work with prospect management professionals and how prospect management can collaborate with data analytics. Most importantly, we will see how they can work together, within their specific teams, when faced with a project that harnesses their skills. In this season we will have two teams that consist of one prospect researcher, one prospect manager, and one data analyst. Both teams will face off to be matched with one development officer who will also be our challenge judge that decides which team ultimately wins Match Makers Season 2: The Prospect Development Edition. Let’s welcome our teams: team one is called The Builders, and consists of Melissa who is our season one winner and prospect researcher, Michelle from prospect management, and Juanita from analytics. Team two has named themselves, The Cultivators, and consists of Charles from prospect research, Shayla from prospect management, and Lauren from analytics. These two teams consist of professionals from different backgrounds, with different experiences in prospect development. They all have cultivated great relationships with their officers, and have their own process in delivering their products. Over the coming weeks we will be introduced to each team, and follow them on their collaboration journey. They will be tested on a series of challenges that involve, prospecting and portfolios to analyze their skills and compatibility with the DO, and their approach to producing a requested product as a team. The final result will be given to the DO to be analyzed for its usability, relevancy, and other preferred skills deemed optimal, he finds his perfect development team match. Now let’s switch gears and meet Anthony our DO. Anthony is an alum of OU, a small-town native, and has been working in development for two years. Over the course of three challenges, Anthony will decide his perfect development team, and we will be watching the entire journey. We hope you will join us next week on Match Markers Season 2: The Prospect Development Edition when Anthony meets the two teams and they begin their first challenge!